A monolith hosting the new Concert Hall in Blaibach. Photography studio NAARO films the concert hall designed and built by Peter Haimerl in the heart of Blaibach (Germany) in its everyday interactions with the surrounding landscape as well as with the local community and the occasional visitors coming from all over Europe. NAARO's camera lingers on the exterior and interior details of the original building, while narrating through powerful framings its role as new benchmark for the social life and the urban renovation of the village as well as cultural reference point within the whole European context. 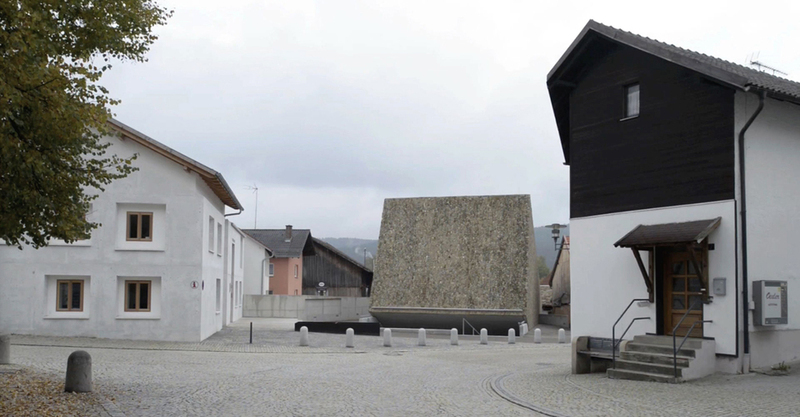 Beyond its undeniable relevance as a newly built cultural icon, the short film aims at showing to a wider audience the architectural values of the concrete building, coated in a granite façade that reminds of Blaibach's stone-carving tradition. Solitary presence located in the village center and adapted to the topographical surroundings, the structure protrudes as a free-standing monolith inclined towards the visitors and the town square. The concert hall was completed as part of the urban development plan "Ort schafft Mitte" (Location Creates Centre) on the initiative of the local cultural program "Kulturwald-Festspiele Bayerischer Wald" (Bavarian Forest), in cooperation with the formerly flourishing tourist center of Blaibach.